Known among the magicians as a spirit that always appeared as a thrush, and then changed into human form decked out with yellow feathers, the demon Camio was an entity that loved to portray the Earth creatures at their colorful best. But now Camio, the fifty-third Spirit of the Goetia, is showing the human creatures of the Earth as being dead and in decay. When viewed his skeletal frame is aged and fragmented from decay. The bright sword he once flashed in the old days is but a rotted stick. What would be his motive for giving us this message? 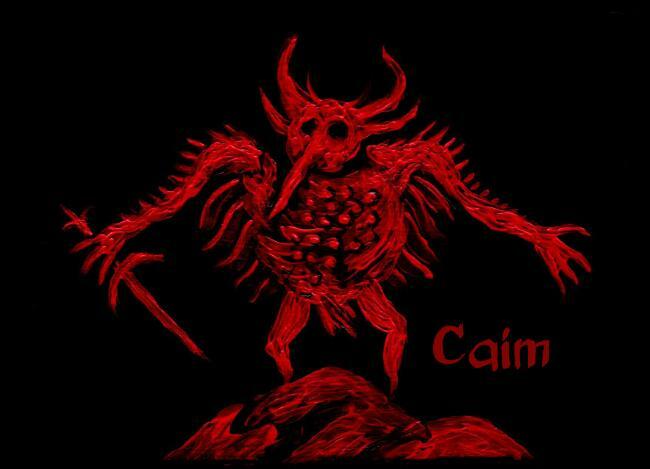 Collin de Plancy once wrote of Camio: "Once with the order of angels, and currently, high president of hell, Caym commands 30 legions. He appears in the form of a blackbird, a main coifed with a headdress and adorned with a peacock tail, or human carrying a tapering sword, and responds from the midst of a burning brazier. "It is said that Camio is the most wise occupant of hell, and that he could outwit even the most seasoned logician. It was with him that Luther had his famous dispute from which he spared us the details. Camio teaches communication with animals and waves and knows of the future." Plancy, who wrote these words about 150 years ago, was echoing a similar description of Camio by Johann Wier in 1583. But Wier said Camio took "the forme of a thrush." He said that when the spirit took the shape of a man, he did something strange. "He answereth in burning ashes, carrieng in his hand a most sharpe swoord." In other words, Camio did not speak, but wrote his words in the air with fiery cinders. Wier also said Camio "maketh the best disputers, he giveth men the understanding of all birds, of the lowing of bullocks, and barking of dogs, and also of the sound and noise of waters." It is obvious that Camio is somewhat theatrical, always going overboard in making his point. That he now appears in this form should be deeply disturbing. Is he not warning us that something is wrong with our world? The death message is told twice over.